In the past few months Beer Cartel’s product range has grown significantly, with the store now home to over 120 beers including world renowned brewers such as Nogne O, BrewDog, Mikkeller, Sierra Nevada and Rogue. As it seeks to further satisfy consumer demand Beer Cartel has moved to providing keg fresh beer through a growler offer. 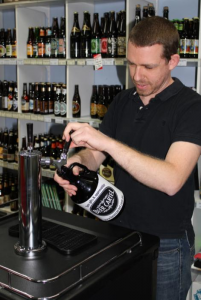 A growler is a two litre container which is filled straight from the keg and sealed with a twist-cap, with a sticker applied displaying information on beer style, origin and alcohol content. Beer Cartel owner Geoff Huens said the reason he wanted to introduce a growler offer to his store was to really display the flavours that are achievable with beer “There are a lot of craft breweries out there that will brew seasonal batches of beer in keg format, but never put it into bottles. By providing a growler service we are now able to provide consumers access to a range of brews that they would otherwise have to go to the brewery to try. And when the brewery is on the other side of the world, or even in other parts of Australia that is near on impossible. We think this is a fantastic opportunity for consumers to try different brews andin the process learn more about one of Australia’s most consumed products. It also fits our business philosophy of reduce, reuse, recycle, minimising the packaging that is used and sold in store”. Mr Huens also believes the store will be the first Sydney based bottleshop to offer a growler service making it a real destination for craft beer lovers. Each growler retails for $12, with prices for filling the growler between $20-$35, dependent on the beer style, alcohol content and country of origin. Mr Huens says that any growler bought should always be refrigerated “Doing so will give the beer a shelf-life of about a week, or around 2 days once re-opened”. Growlers can be purchased at the Beer Cartel bottleshop, Unit 9, 87 Reserve Road Artarmon, NSW. The first growler fills are to commence Saturday 6th August, pouring The Butcher Porter from Rocks Brewing. This is based on a traditional Robust Porter but with a twist from the norm. The beer pours with a tan head and appears jet black. Made with ale and crystal malt, the beer departs from the norm by using chocolate malt to darken and flavour the beer and flaked oats to give a silky smoothness and stiff beer foam. It is amazing how such businesses reached Sydney over the years.